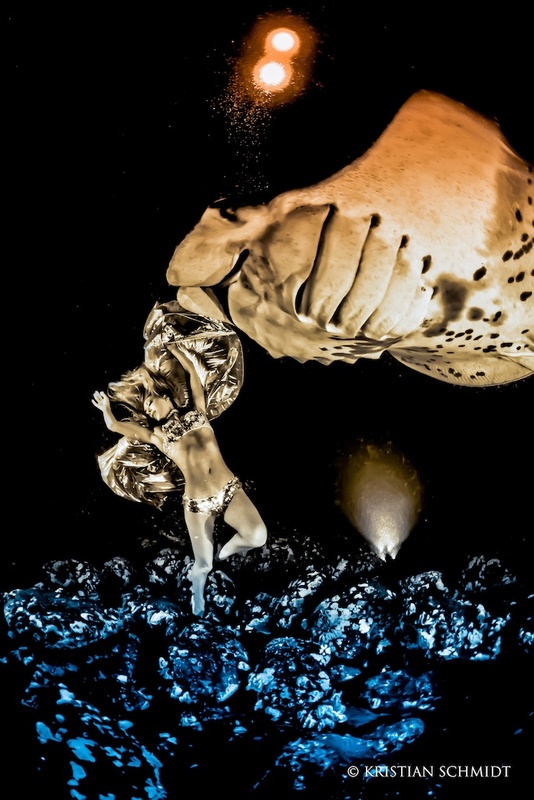 I worked closely with the fabulous underwater dancer/mermaid model – Hannah Fraser for months leading up to the Hawaii project to co-produce the unique concept for the world’s first ever Manta Ray Fashion/conservation shoot. We had an extremely precise vision, however we were both apprehensive as to the chances of actually capturing this never before seen imagery. Nevertheless, we were resolute in our commitment to make it happen one way or another! Above all else, Hawaii has been a world leader in Manta Ray conservation, having established laws to protect manta rays from any exploitation. Kona Hawaii is home to the world famous Manta Night Dive, one of the most spectacular diving experiences in the world! Mantas are beautiful, gentle creatures, capable of high levels of intelligent behaviour, who are being slaughtered for their gills. These amazing animals are long lived (up to 50 years or more), slow to reach maturity, and produce very few offspring (1 pup every 2-3 years). The shoot is a key element in a conservation media campaign by WildAid and Shark Savers, working together on the Manta Ray of Hope project aimed to raise serious awareness for manta rays leading up to an extremely important meeting in early March. The United Nations Convention on International Trade in Endangered Species (CITES) meets every 3 years, and 177 member nations vote on whether to grant international protection to certain highly threatened and endangered species. After 3 years or incredible effort, manta rays are finally on the voting ballot. Now is the time put in place urgently needed protection. Unsustainable fisheries are now wiping out their small and isolated populations. One of the primary drivers of this increase in fisheries is the gill trade, and market that uses Manta gills in a psuedo-medicinal tonic in China and elsewhere in Asia. On the other hand, Manta Ray Eco-Tourism is worth over USD 140 million world wide, and this tourism is now under severe threat from fisheries and the gill trade. Our objective with this shoot was to present the beauty of the manta rays, their willingness to interact with humans in the hope of inspiring people to conserve this magnificent animal. So many things have to be in alignment to make a shoot this challenging come together successfully. Weather, swell, water visibility, animal interaction, the model’s underwater ability, safety divers, lighting, temperature, and of course cameraman skill! The crew had so many challenges along the way, but these ocean professionals knew that when working with the ocean that you have to just flow with it! As a natural follow up to our Whale Shark Fashion Shoot, I was joined by my good friend and talented wildlife/fashion photographer Kristian Schmidt to shoot this project. This Shoot Was Powered by Gear from Backscatter and Light & Motion! As even a single technical failure could prove disastrous for the shoot, we partnered with Backscatter to ensure we had the right underwater camera gear and rigging equipment. Our team was outfitted with and array of Canon 1Dx and Canon 5D Mark 3 Nauticam underwater systems, plus a complex array of rigging and technical accessories. Without this gear, none of what we accomplished would have been possible! Lighting was key to the success of the shoot, and working closely with Light & Motion, we assembled and deployed a lighting array of 16 Sola 4000s that generated almost 70,000 lumens of light underwater! No other lighting solution could have delivered the massive amount of light we needed, with several hours of burn time and in such a compact format! On the ground in Hawaii, The Manta Pacific Research Foundation, Jack’s Diving Locker, and Torpedo Tours provided the critical guides and dive operations to ensure our shoots were perfectly timed and orchestrated. Lastly, we were honor to have Oscar winning director of the Cove, Louie Psihoyos, join us for part of our shoot and offer generous support for the project from OPS! We hand-picked the team of professionals who were not just top of their fields, but also incredibly passionate about the ocean and conservation. – Hannah has been working as a professional mermaid for over a decade, using her underwater modeling skills to highlight the ocean environment. 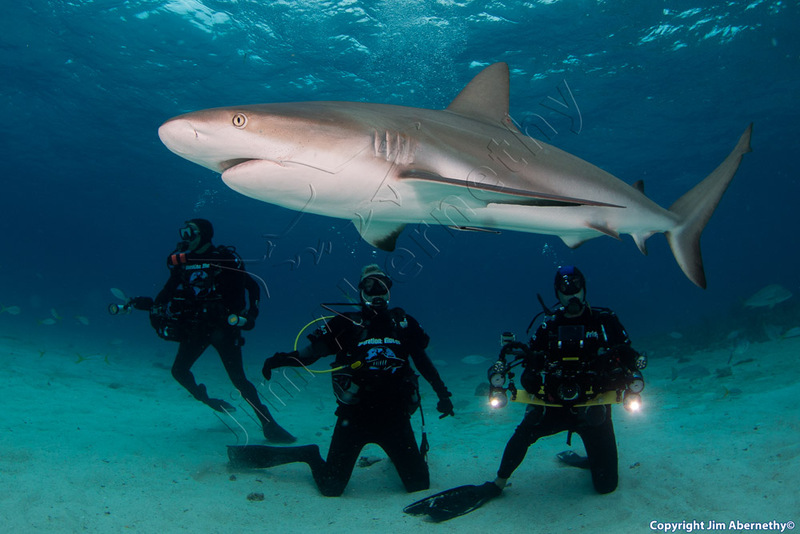 – Shawn is an award winning underwater and conservation photographer/cinematographer, with extensive experience working with big ocean animals and human subjects. – Kristian is a world-class fashion/wildlife photographer who’s newly acquired passion for underwater photography has resulted in immediate and impressive results. – Tre Packard and Akira of Pangeaseed worked tirelessly as safety divers and lighting assistants to ensure every shoot went off without a hitch. – Maria Teresa Chavez handled all make up and support, including cooking some great meals that kept Hannah and the crew focused on issues essential to our delivery. – And finally, the talented Eric Donaldson of Nineteen87 donated his time to document the entire behind the scenes story of the shoot! With our combined experience in the ocean we were able to communicate wordlessly underwater and adjust to the nuances of the changing environment at all times in synch. Hannah danced effortlessly on the ocean floor with these massive, yet incredibly graceful and gentle Manta Rays swirling around her! She was tied down 30 ft deep to the ocean floor with 50 pounds of weights on one ankle, a huge swell pushing her back and forth above the sharp encrusted boulders on the ocean floor, with viper eels occasionally wrapping around her legs, holding her breath for minutes at a time, unable to see clearly without goggles, in freezing cold water at midnight with huge wild mantas of up to 15 ft wide brushing up past her. The skill, training and courage required to achieve this extremely challenging look was of the awe inspiring! We worked 5 days straight, up to 20 hours a day! When we started watching the footage and seeing the photos appear we were utterly elated, as it was exactly what we had hoped for, and even exceeded our expectations! Tears were shed in the name of creative satisfaction by all involved! 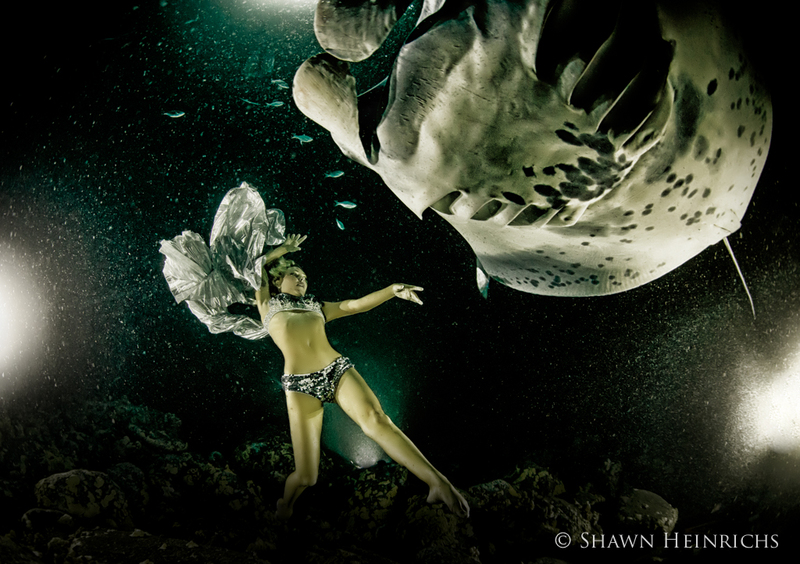 Beyond Hannah’s fearless and graceful work, the Manta Rays were the stars of the show. These creatures are very intelligent and curious animals, and they are often seen to be interacting with divers and snorkelers for extended periods of time. Plankton is attracted to the lights in the water, and the manta rays enjoy a feast of their concentrated natural food source. For almost 20 years, Manta Rays have been showing up each night and divers/snorkelers from across the world have come to interact, appreciate and learn more about these magnificent and vulnerable creatures. This has created a mainstay for the Hawaii manta tourism industry, generating millions of dollars each year in direct tourism revenue. It’s a win/win situation! The reaction of people when they see the footage and imagery alternates between utter disbelief and accusations of CGI and photoshop, to even envy. But mostly we are receiving genuine respect and support for the real conservation outcome we are trying to achieve and inspire. Sir Richard Branson was one of the projects supporters, and is a passionate voice for the environment. He is genuinely in love with the ocean and its creatures. Sir Richard is the International Manta Ray Ambassador for WildAid. This marks the world release of Sir Richard’s Manta Ray PSA. I work closely with Sir Richard on marine conservation projects and the two have spent hours together filming charismatic marine life in the ocean, including whale sharks, manta rays, sailfish baitballs and even tiger sharks! 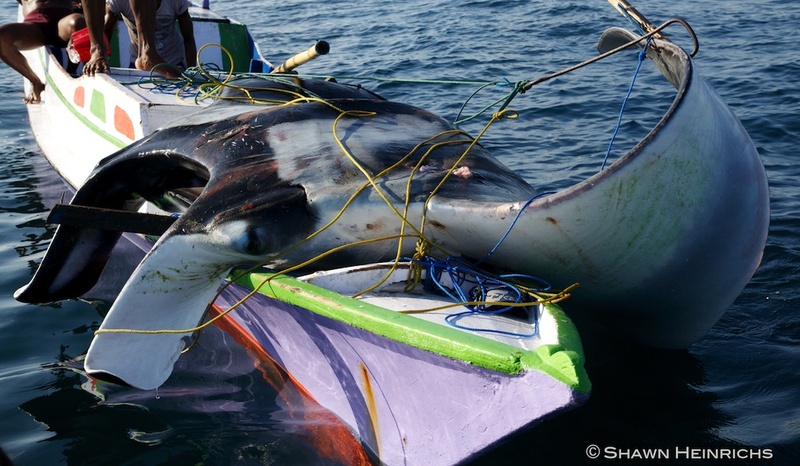 In addition, countries must move quickly to put regulations in place to stop the slaughter of manta rays and protect these precious and highly valuable creatures. Had no idea they were that endangered, great work. Awesome photos! Video was very moving!! Hope it brings awareness to your efforts!